Update! 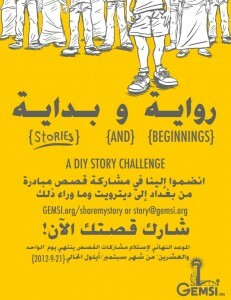 Rawaya wa Bidaya, Bilal in Beirut, and the GEMSI team prepares for travel! Rawaya wa Bidaya - POSTERS! 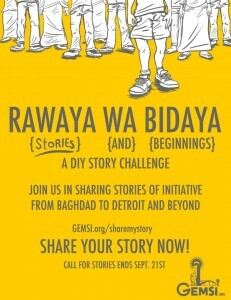 We are well underway collecting stories and momentum for our live-stream event to share stories of DIY problem solving from Baghdad. One really exciting step in this process are these wonderful posters designed by Lee Devito! We are still searching and accepting stories, please help us get the word out by sharing these posters and talking to your community about their own stories of initiative and problem solving! -- Especially if you're in Baghdad! Check out the FB event page for more details! Holy wow! 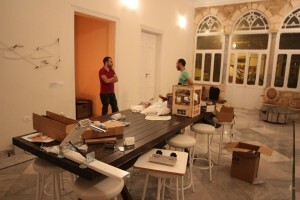 Bilal made it to Beirut just about 1 day ago and is already hard at work collaborating and taking part in building out Lamba Labs Beirut Hackerspace. Screen printing, logo finalization, website, physical space - it's all happening now! I send my joyful congratulations to Bassam and the rest of the Lamba Labs team! Here's a shot from inside the space! 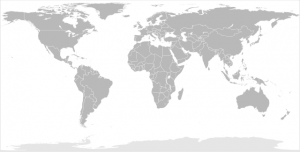 As the team prepares for travel, the fact that we are an international organization is becoming evermore tangible. We have been busy booking flights, collecting materials (so many awesome electronic components yo! ), and coming together for our final team meetings in SF. I have seen so much excitement and gratitude in our team to be working with each other and soon to be working face-to-face with the crew in Beirut, the TEDxBaghdad team, and the numerous other collaborators in the Middle East! Amidst our preparations, we're still lovingly tending the Kickstarter, which, despite the challenges, continues to inspire as the support keeps rolling in. Backers we <3 you! All the best everyone, until next time... Qarly out!